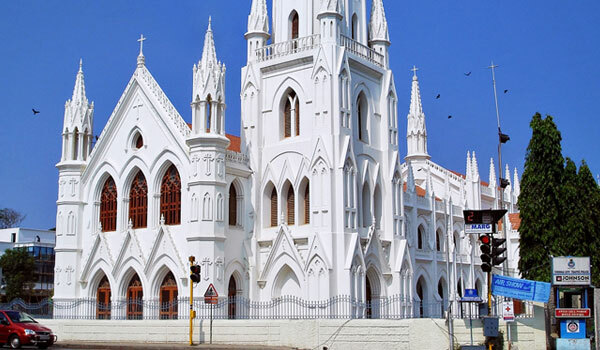 This Roman Catholic basilica, which is only 5 kilometers from The Raintree Hotels, is built over the tomb of St. Thomas, one of the 12 apostles of Jesus. The church was rebuilt by the Portuguese in the 16th century. In 1893, it was demolished and the current Gothic-style structure was constructed. A museum is filled with St. Thomas memorabilia, a short film about his life plays in the mini-theater, and stories on stones illuminate his deeds. Daily: 6:00 a.m. to 8:00 p.m.
Can I visit the tomb of St. Thomas? Yes, you can. The tomb is open to both tourists and pilgrims. In fact, you’ll be able to visit this sacred site from an entrance outside the church so you won’t disturb the faithful attending services inside. After spending time in Santhome Cathedral Basilica, you can stop by the liturgical center. There you'll find a fine selection of Christian artifacts and books that are available for purchase.